Look for entrees that offer a simple fish, meat, or poultry option. Stay away from pasta and things with sauces that may contain cornstarch, flour, sugar, or other thickening agents. When rice or potatoes are served, ask for two servings of the vegetable instead. Order a salad with dinner, and specify you want a dressing without sugar. Oil and vinegar are usually available, and many restaurants make their own vinaigrettes, you just have to be assertive and ask what is in it. I also think it’s reasonable to ask for no dressing, and bring some from home that you trust the ingredients. Dressing is OFTEN loaded with honey and sugar. Instead of appetizers loaded with bread, ask for veggies, or guacamole and veggies. Olives are a great first course, and they won’t spike your hunger the way a piece of bread will. Skip all bread. Skip dressing, pita, croutons, naan, and rolls. They aren’t worth it. Skip the french fries. If you crave a carb, ask for a baked sweet potato or winter squash. Stick to protein sources like eggs, poultry, grass fed beef, low mercury fish*, pork or tofu. 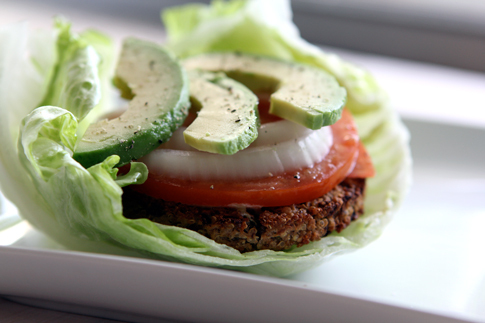 If you are craving a burger, have it! Just ask for it without a bun. The Red Robin, 5 Guys, and McDonalds chains even offers a lettuce wrap burger, and I honestly don’t miss the bun! There is a little local market that makes sandwiches in my town. We get chicken salad and ask for it on romaine leaves. They are happy to do it that way. Prepare your “head” for going out. Read the menu online when you’re not ravenous, and figure out how you’re going to tweak it. So what if it is $2 more to substitute or add something?! Are you worth it? YES, you are. Think big picture here. If you stay sick and inflamed, one co-pay on a prescription costs more than that. Omelettes are always pretty safe if you can’t find anything else on the menu. Ask for lots of veggies and skip the toast and potatoes. Check out my recipe links for when you are cooking at home!